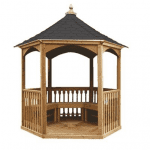 A gazebo that has some great aspects, including the steel frame, which is not only strong but coated in powder that prevents rust. Add to this the fact that you have six walls with windows,and a good size overall, and it’s a real bargain for the price. 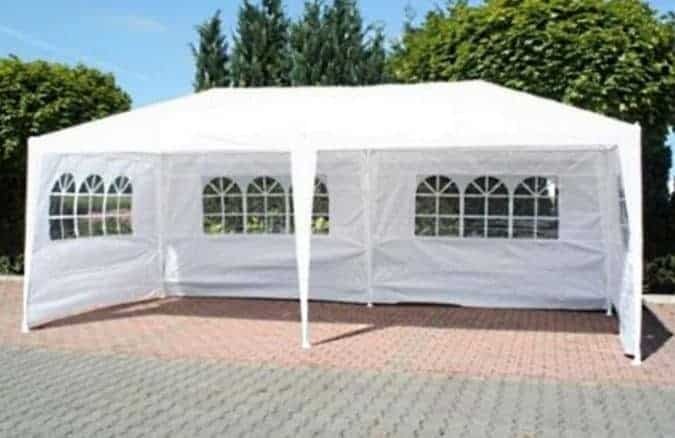 This marquee is perfect for entertaining your guests. It has a number of features that make it a great addition to your garden. As regards measurements it comes out at 300 cm wide and 600mm in depth. 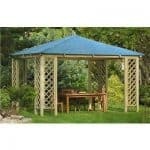 The height of the gazebo is 250 cm. The gazebo has been formed largely with white polyester. 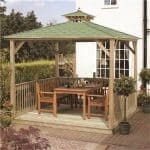 This is a good choice of material as it happens, because it allows for plenty of sun protection as well as some waterproofing against the rain. You get a great level of protection against rust and erosion, with a frame that is crafted from high quality steel. 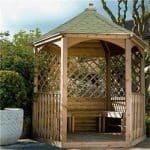 In addition to this, the frame has also been coated in special powder that ensures your gazebo is further protected against rust. This means you have a strong building that will last for years to come. This cannot be overstated as regards quality. For the low price of the unit, you have a very long life structure. There is no requirement here for treatment. Having that strong steel covered in powder effectively stops rust from forming and means you get tremendous value. It also helps because you just don’t have to treat it every year, which saves money and time. We like this aspect, and we were particularly pleased to see it included in an item that is of such a low cost. There are six side walls here with windows. When you are inside the marquee you get the benefit of plenty of light. It’s a nice aspect too, because again we can’t stress enough that this is a low cost item. Having all of that light for less than £100 is a big deal. Step inside, and you instantly feel like you’re in a bigger installation, simply because the amount of light is excellent. The unit does not have any customisation options available for it. Well, put it this way. You’re getting a large and spacious unit that has plenty of light because of all those windows. In addition to this you have a frame that is powder coated and therefore can withstand rust for years. And all of this for under £100. 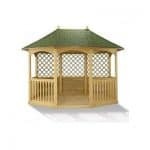 One of the best value gazebos we have seen for a long time.